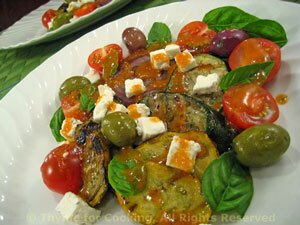 Grilled Zucchini Salad with Feta, Olives, Thyme for Cooking easy gourmet. I used 1 small green and 1 small yellow courgette for this salad... Just for color and interest. A basket works best and helps keep the onion together in slices. Serve the salad still warm from the grill. Cut zucchini into 1/3" (1cm) thick slices. If using small zucchini cut at an angle for larger slices. Lay zucchini and onion on a plate. Brush both sides with oil and sprinkle with paprika. Place in a grill basket and grill over direct heat for 7 minutes, turning once. Remove and arrange, slightly overlapping, on two plates. Whisk vinegar, ketchup and mustard together in a small bowl. Top zucchini slices with tomatoes, olives, feta and basil leaves. Drizzle with vinaigrette and serve.